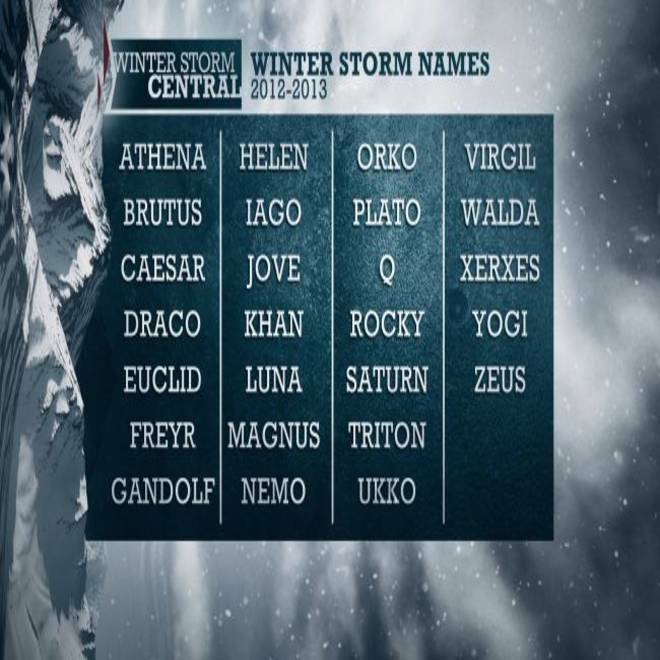 The Weather Channel plans to name severe winter storms beginning this year. NBC's Al Roker reports. During the upcoming 2012-13 winter season, The Weather Channel will name noteworthy winter storms. Our goal is to better communicate the threat and the timing of the significant impacts that accompany these events. The fact is, a storm with a name is easier to follow, which will mean fewer surprises and more preparation. Naming a storm raises awareness. Attaching a name makes it much easier to follow a weather system’s progress. A storm with a name takes on a personality all its own, which adds to awareness. In today’s social media world, a name makes it much easier to reference in communication. A named storm is easier to remember and refer to in the future. The question then becomes: “Why aren’t winter storms named?” In fact, in Europe the naming of weather systems has been going on for a long time. Here in the U.S., summer time storms including thunderstorms and tornadoes occur on such a small time and space scale that there would be little benefit and much confusion trying to attach names to them. However, winter weather is different. Winter storms occur on a time and space scale that is similar to tropical systems. In fact, historically many major winter storms have been named during or after the event has occurred. Examples include “The President’s Day Storm” and “Snowmageddon.” Yet, until now, there has been no organized naming system for these storms before they impact population centers. One of the reasons this may be true is that there is no national center, such as the National Hurricane Center, to coordinate and communicate information on a multi-state scale to cover such big events. The National Centers for Environmental Prediction’s Hydrologic Prediction Center (HPC) does issue discussions and snowfall forecasts on a national scale but it does not fill the same role as the NHC in naming storms. Therefore, it would be a great benefit for a partner in the weather industry to take on the responsibility of developing a new concept. This is where a world-class organization such as The Weather Channel will play a significant role. We have the meteorological ability, support and technology to provide the same level of reporting for winter storms that we have done for years with tropical weather systems. In addition to providing information about significant winter storms by referring to them by name, the name itself will make communication and information sharing in the constantly expanding world of social media much easier. As an example, hash tagging a storm based on its name will provide a one-stop shop to exchange all of the latest information on the impending high-impact weather system. There will be many differences from the “tropical model” for naming winter storms. Unlike tropical systems, winter weather takes place at latitudes under extreme energy and forcing from the atmosphere. Often a weather system that is expected to strike a metropolitan area three days from now has not even completely formed in the atmosphere. Therefore, naming of winter storms will be limited to no more than three days before impact to ensure there is moderate to strong confidence the system will produce significant effects on a populated area. In addition, the impacts from winter systems are not as simple to quantify as tropical systems where a system is named once the winds exceed a certain threshold. The process for naming a winter storm will reflect a more complete assessment of several variables that combine to produce disruptive impacts including snowfall, ice, wind and temperature. In addition, the time of day (rush hour vs. overnight) and the day of the week (weekday school and work travel vs. weekends) will be taken into consideration in the process the meteorological team will use to name storms. This is an ambitious project. However, the benefits will be significant. Naming winter storms will raise the awareness of the public, which will lead to more pro-active efforts to plan ahead, resulting in less impact and inconvenience overall. Coordination and information sharing should improve between government organizations as well as the media, leading to less ambiguity and confusion when assessing big storms that affect multiple states. It will even make it easier and more efficient for social media to communicate information regarding the storm resulting in a better informed public. And, on the occasion that different storms are affecting separate parts of the country, naming storms will allow for clearer communications. Finally, it might even be fun and entertaining and that in itself should breed interest from our viewing public and our digital users. For all of these reasons, the time is right to introduce this concept for the winter season of 2012-13.